Provide a physical environment that is healthy, safe, and nurturing. Provide a loving, welcoming, and joyous atmosphere for the children. Provide an environment of routine and consistency. Provide experiences that will develop qualities of responsibility and independence. Create opportunities for the child to practice sitting still, working independently, concentrating, following directions, and working on a task until its completion. Provide opportunities to develop the child’s imagination through pretend-play, creative story-telling, and art. Encourage forming friendships with classmates. Encourage sharing and taking turns. Encourage and model responsibility of caring for one’s own things as well as caring for and maintaining the classroom (simple chores assigned to each child). Encourage child to work cooperatively with others and to begin to understand and respect differences among individuals. Create an environment where conflicts are solved constructively. Create opportunities to practice/promote thoughtfulness and giving. • auditory discrimination through identifying familiar sounds, rhyming. • activities to improve observation skills. Provide a wide range of art, drama, and music activities. Provide opportunities and encourage self expression through music, movement, art, and drama. Provide exposure to the French language through songs and simple conversation. Provide opportunities for large muscle development and control. Provide opportunities for small muscle development and control. Provide opportunities to develop balance and coordination, hand-eye coordination, and spatial skills. Encourage good habits of health, hygiene, diet, and safety. Create an opportunity that encourages discovery and exploration. Create experiences that will increase a sense of competence and pride in accomplishments. Create opportunities that will further develop qualities of responsibility and independence. Provide experiences that will develop the child’s initiative and help him/her to learn to face and resolve conflict or overcome problems. Encourage social interaction among all classmates. 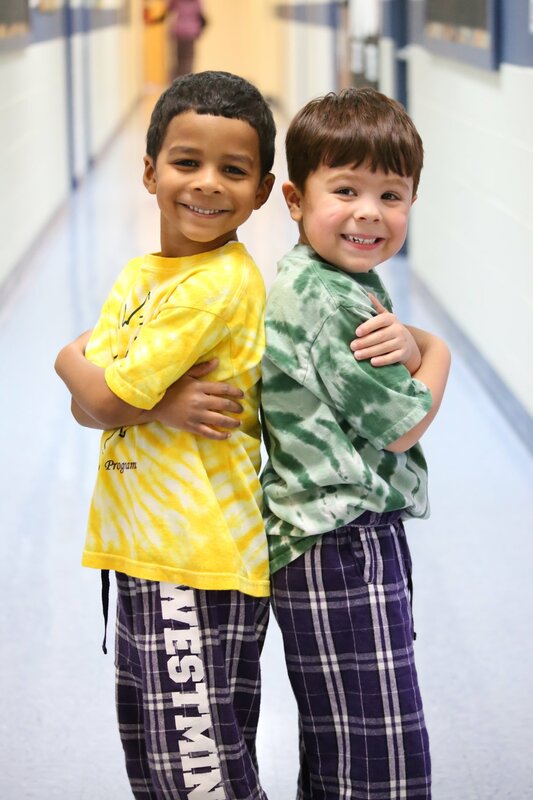 Encourage forming friendships with more than one classmate. Encourage expressing oneself through verbal expression of feelings and thoughts. Encourage compliance with rules and following directions. Create an environment where conflicts are solved constructively (via talking through problems and reasoning). Promote and create opportunities to practice thoughtfulness and giving. Provide language-development activities in listening and expressive language. • Auditory discrimination and memory. • beginning addition and subtraction skills using math manipulatives. • activities to improve observation and memory skills. • simple map skills activities. • acting out stories with puppets and/or props. Provide an environment to begin learning French. Provide opportunities to further develop balance and coordination, hand-eye coordination, and spatial skills.